Mascara is one of the most frequently purchased beauty products because it has the shortest shelf life: it should be replaced every 2-4 months. So even though you probably didn’t use up every last pigment in the tube—and even if you loved it, and even if it was expensive—it’s important to abide by this recommendation because if you don’t, you could end up with a nasty eye infection: Streptococcus pneumoniae can cause pink eye; Staphylococcus aureus can lead to styes; Pseudomonas aeruginosa can cause skin infections on the delicate tissue on your eyelids; which in turn can become blepharitis, an uncomfortable and really not-pretty inflammation that can even cause loss of eyelashes. In which case, you won’t be needing ANY mascara! Putting an expiry date sticker on your mascara just might be a smart move. 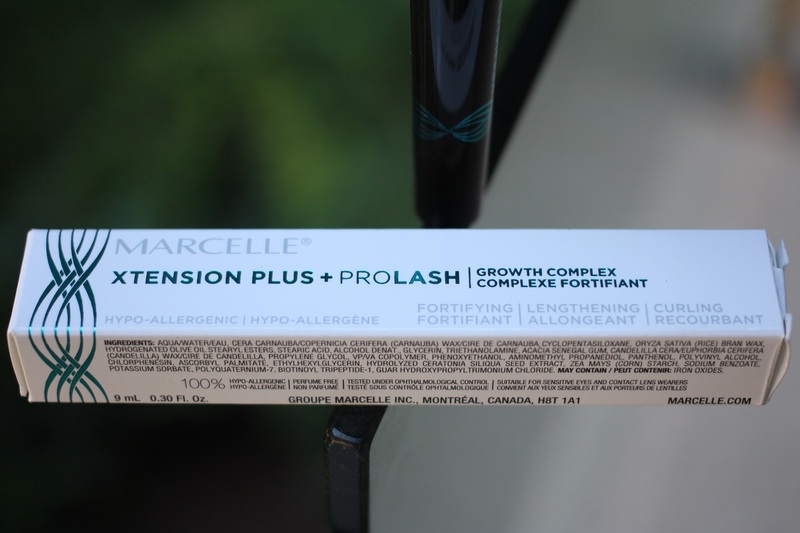 After saying good-bye to the last one by La Roche Posay, I decided to try the Xtension Plus PRO Lash Growth Complex Mascara by Marcelle. And oh my gosh, it’s good. It combines all the lash-enhancing beauty benefits of mascara (length, volume, curl, definition) plus the cosmetic benefits of a lash-growth serum (lusher and stronger lashes) in one product. This version of our best selling Xtension Plus Mascara (winner of the 2013 Grand Prix ELLE) contains a special conditioner for your lashes which promotes growth, creating visibly longer and thicker lashes in just 2 weeks! The additive contains peptides and vitamins which stimulate the follicles and make the hair grow faster and stronger, while preventing breakage. FEATURES Extremely lengthening formula with added vitamins and peptides Prevents breakage, visibly enhances growth Notice changes within 2 weeks. Specially shaped dual-sided brush. No clumping or flaking. Safe for contact lens wearers and sensitive eyes. I’ve had great success re-growing my brows (review of a super serum to come), but limited luck with the lash line, so I was super intrigued with a mascara that is actually good for your lashes. As always, I look for fragrance-free make-up because although I love perfume, I don’t love it on my face. The other factor to consider is cost: lash serums are pricey. I purchased this mascara on sale for $10 at the drugstore. I can’t attest to the lash growth claim yet since I just started using Xtension Plus, but I can tell you the promise of beautiful lashes it creates are true. The Marcelle website suggests a tip for best results: use the longer bristles of the dual-sided wand for length and the shorter bristles for volume. I love the natural effect from the small stiff brush and the gentle formula works wonders for sensitive eyes like mine. It’s also easy to layer for more drama without any smudging or flaking. With this mascara, it looks like you have naturally great lashes. I’ll be buying this mascara again.